Auto dealers say closing facilities will not save automakers much money, but GM and Chrysler say closures are crucial to survival. Steve Biegler added a black armband to the Chrysler sign outside his South Dakota dealership, one of more than 700 slated to lose its franchise. Chrysler shuttered 789 dealerships nationwide. Now these dealers and their employees are recovering from the shock and looking to the future. NEW YORK (CNNMoney.com) -- These are hard times for car dealers. Across the nation, General Motors and Chrysler dealerships are pulling down their big roadside signs and closing their doors. The companies say they have no choice but to cut the cord and save money. The dealers, who say they are being scapegoated for the epic problems at GM and Chrysler, are hopping mad. On Friday, top executives of General Motors and Chrysler as well as several dealers appeared at a congressional hearing. It marked the second Capitol Hill hearing on the issue this week. Fritz Henderson, chief executive of General Motors (GMGMQ), and Jim Press, deputy CEO of Chrysler, testified along with six GM and Chrysler dealership owners and a dealer representative at a House Energy Committee hearing. Chrysler closed 789 dealerships, or 25% of its more than 3,150 operations nationwide, this week. GM is set to cut roughly 2,500, or 40% of its 6,300 dealerships, by the end of the year. Closing auto dealerships is a difficult and emotional decision, as hundreds of thousands of jobs could be at stake. Lawmakers spoke about the human element of dealership closings in their congressional districts. "Mr. Henderson and Mr. Press, your corporations were built on the backs of people you see in this room," said Rep. Bruce Braley, D-Iowa. "Each of you owe them and the taxpayers of this country a detailed of reasoning of your business decisions." Both Henderson and Press nodded in affirmation of Braley's statement. The dealers and John McEleney, chairman of the National Automobile Dealers Association, argued that closing dealerships does not affect the automakers' bottom lines. Dealers are independently owned and operated, and do not receive significant administrative support from manufacturers, they said. Furthermore, many of the dealerships set for termination are profitable. "Everyone agrees that both Chrysler and GM need to decrease costs and increase revenue to survive, but eliminating dealerships does neither," said McEleney, in testimony. "The manufacturer's costs do not vary whether there are 6,000 dealers or 3,000 dealers." The dealership owners agreed. "Our dealerships do not cost auto manufacturers a penny," said Alan Spitzer, who owns Spitzer Automotive Group of Elyria, Ohio, which has seven dealerships that are slated to be shut down by GM and Chrysler. "All products and services, which Chrysler and GM provide to a dealership, are charged back to the dealership at a profit. If we lose money it comes out of our pocket, period." Lawmakers also fumed that Chrysler dealerships did not have the ability to appeal. GM dealerships can appeal, and Henderson said the company has removed 45 of the franchises from the termination list for various reasons. Henderson confirmed that three dealerships in Massachusetts were taken off the list after Rep. Barney Frank, D-Mass., persuaded GM to keep them open. Automakers face scrutiny regarding the dealers they are keeping as well. Texas Attorney General Greg Abbott announced Friday afternoon that his office will file an objection against GM, charging that the company's restructuring plan violates the rights of dealers under Texas law. Abbott said the plan limits dealers' ability to market other brands and choose their locations. The automakers and the White House, however, believe the decision will help save even more jobs. "This has been the most difficult business action I have personally ever had to take," said Press. "But the optimization of Chrysler's dealer restructuring plan was necessary to save the company." Press said that for the most part Chrysler has cut the least profitable businesses, but those that are profitable likely won't be moneymakers under the company's new sales structure. 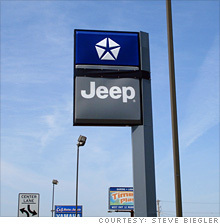 The company wants to sell Chryslers, Jeeps and Dodges at each of its dealers so it can save money by discontinuing similar minivans, crossover SUVs or cars that appeared in multiple brands. Press said the so-called sister vehicles cost Chrysler $350 million per model, but the bigger problem was that the company competed with itself -- "one of the biggest reasons why the company went into bankruptcy." Press said 555 of the dealerships that could not accommodate selling all three brands were terminated. In addition, Press noted that many of the dealerships that it ended relationships with are making the vast majority of their money off of used cars anyway and will be successful independent of a relationship with Chrysler. For GM's part, Henderson said closing dealerships will save the company $2.5 billion a year, or more than $1 million per dealership, as GM eliminates many direct support programs such as dealer incentives, as well as market and advertising support. A GM spokeswoman said that the dealerships that will be kept open will be more profitable, and therefore need fewer incentives and support from the manufacturer. But he said that more important than cost savings was making its dealerships more efficient and competitive. GM's dealerships grew too quickly and began to compete with one another, Henderson said. That led to rundown facilities and the loss of top-tier sales staff. "GM's success over the long haul ... will depend in no small part on a healthy, strong and profitable dealer network that can provide the industry's best customer service and enhance the image of our four remaining brands," he said. "Dealers who underperform simply cannot provide these benefits to our customers," he said. Henderson said the dealership closings will save more than 200,000 jobs at GM's remaining dealerships. "GM's remaining dealerships will be better positioned to keep their current GM customers, while aggressively marketing to take sales from competitors," Henderson added. The Obama administration supports the automakers plan, too. The Treasury Department's Auto Task Force told GM and Chrysler to be "more aggressive" with its dealership cuts, task force member Ron Bloom told the Senate Banking Committee on Wednesday. He said the task force has avoided issuing specific decisions about dealers, but noted that the closings were necessary to help the companies rebound.